Welcoming winter at Dar Taliba with exciting learning opportunities for 143 girls! 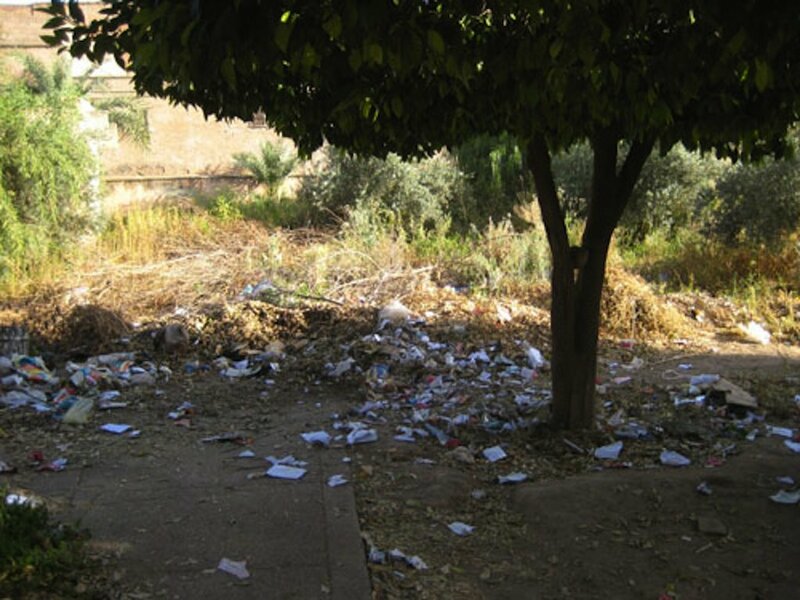 It’s been a busy few months in the Dar Taliba gardens. 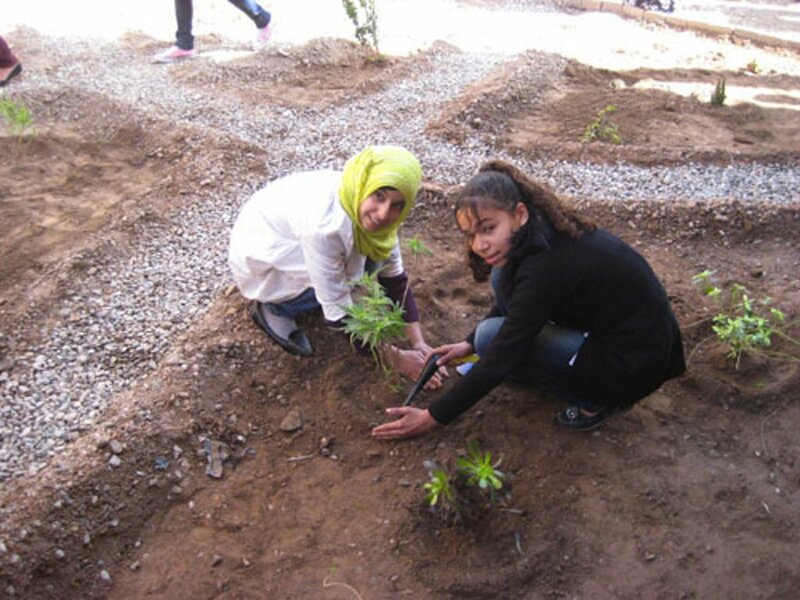 Since our last report, the Dar Taliba students have participated in fourteen garden trainings covering a wide range of topics including making compost, taking plant cuttings and preparing green manure fertiliser. 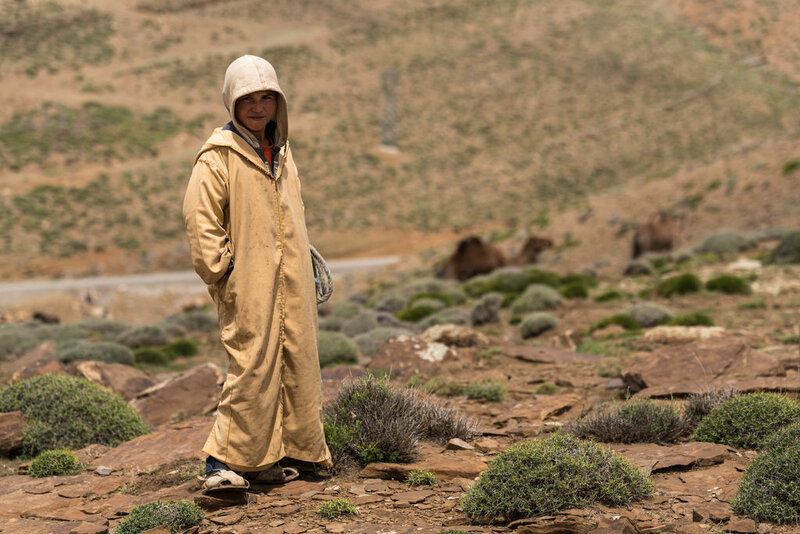 Last month, we invited local plant expert Hamid, who collaborates with us and our partner Moroccan Biodiversity and Livelihoods Association (MBLA) and manages a successful community plant nursery in the High Atlas. Building on his experience as a plant nursery keeper, Hamid held an interactive session on Amazigh indigenous plants such as Moroccan wild thyme and how to select and take plant cuttings (a cutting is a small piece of plant which contains at least one stem cell of the parent (stock) plant). 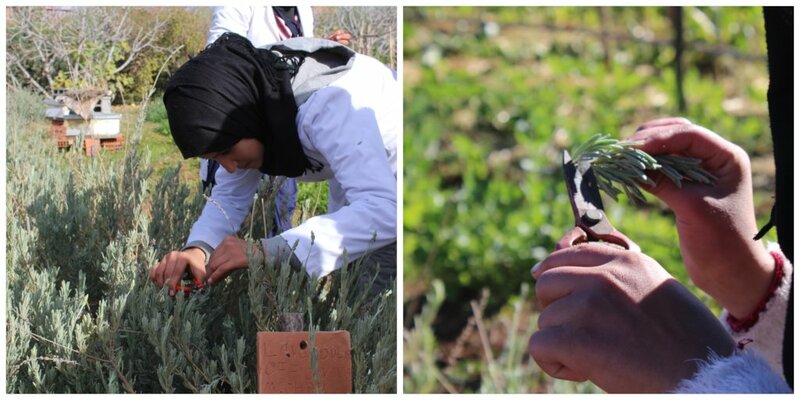 After the girls took several plant cuttings from the aromatic and medicinal garden, including lavender, mint and rosemary, they carefully prepared several plant trays and planted the cuttings according to the techniques they learned from Hamid. 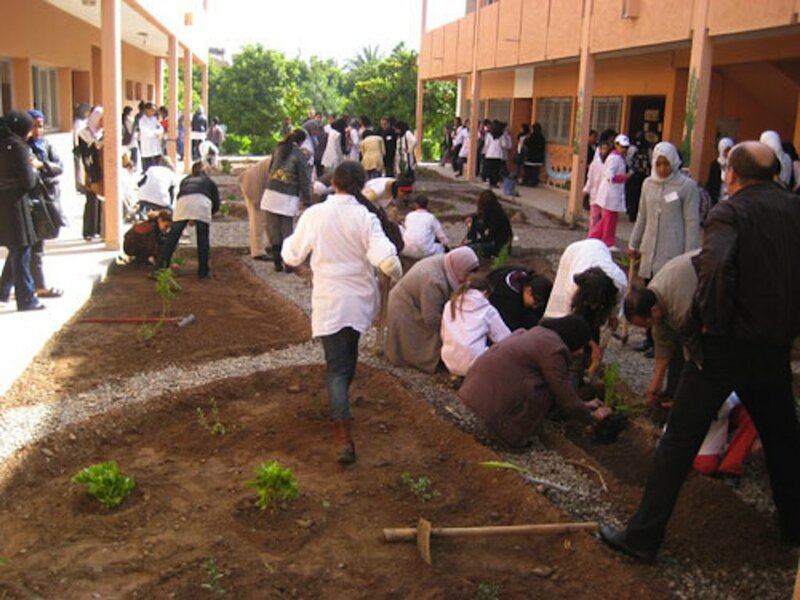 Once the plant cuttings are strong enough and start growing roots, the students will transplant them to plant bags and take them home to plant in their communities in the High Atlas mountains. Another fun activity was the training on making compost during which the students learned more about how to take good care of the soil and improve its conditions. “Composting is a way of giving back healthy and nutrient rich soil to the Earth”, Cécile from Radiant Design explained. “Whenever we harvest vegetables or clear weeds, we remove nutrients from the soil. Composting is an essential practice to keep our soil healthy and fertile, so it can provide us with nutritious food”. The girls worked very hard to create a big compost pile and we look forward to seeing the result of their efforts in a few weeks when the compost will be ready for use! We are really grateful for the generous support of our GlobalGiving donors in creating this green space and making these exciting learning opportunities happen. Thank you! Although it’s winter still, we are all very excited about spring and watching the garden bloom. Only a few days ago, the Dar Taliba team spotted several ladybirds, and we all know these beautiful creatures are a gardener’s best friend. They feed on pests and keep our plants healthy, which is great news for all the vegetables the Dar Taliba students have been planting. Over the next few weeks, the Dar Taliba team is planning to organise short sessions before trainings to talk about local plants and their traditional uses. First up will be rosemary. We look forward to sharing more about these upcoming garden activities in our next report. In the meantime, you can follow us on Facebook and Instagram, or visit our website for more updates. 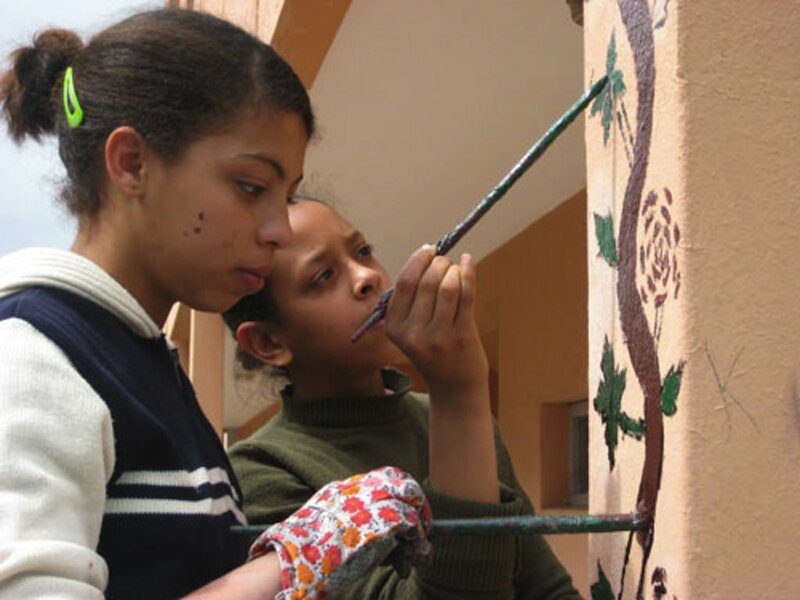 Back to school and garden trainings at Dar Taliba! Since we reported last, the Dar Taliba students are back at their all-girls boarding house after a long summer vacation from school. 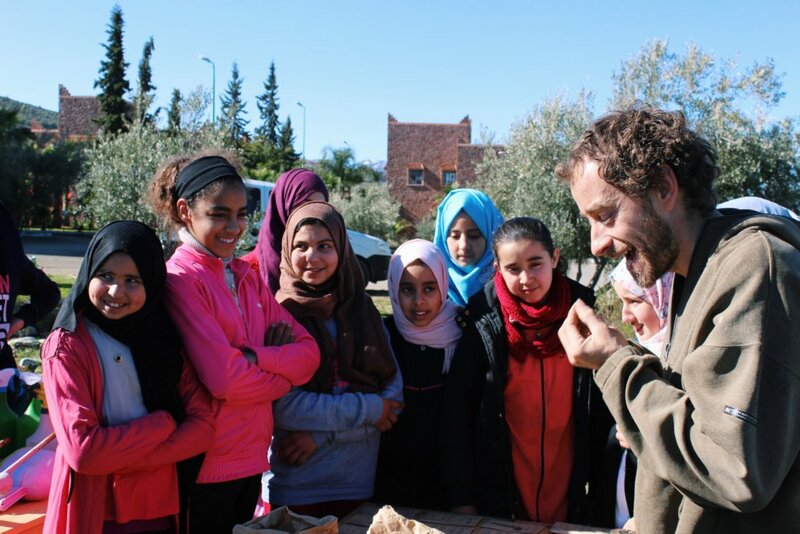 We are very excited to share that we have started the new school year with an exciting series of permaculture trainings in collaboration with our partners Moroccan Biodiversity and Livelihoods Association and Radiant Design. Together with Dar Taliba Director Jamila and our colleagues Cécile and Laila from the Radiant Design team—an all-girls team this year—we’ve carried out eight training sessions in the garden since the beginning of the school year, which began late September. 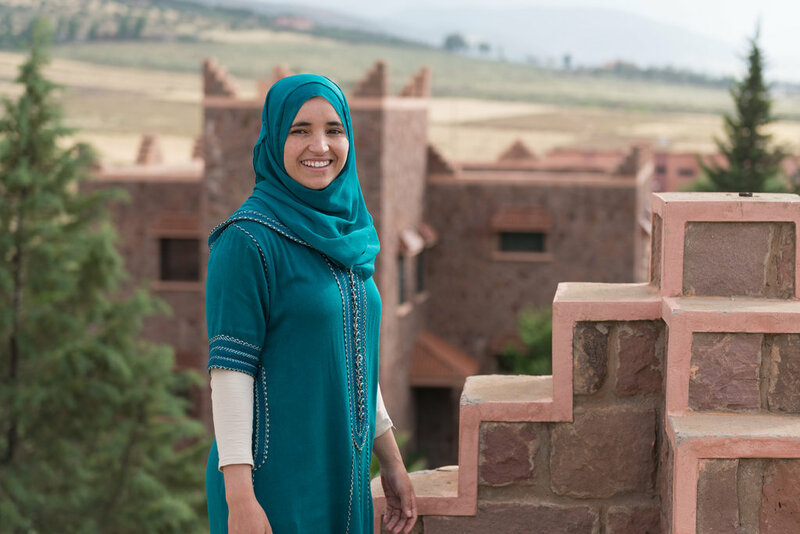 At the start of every school year, new students enrol at Dar Taliba and this year was no exception with 52 new girls in residence. 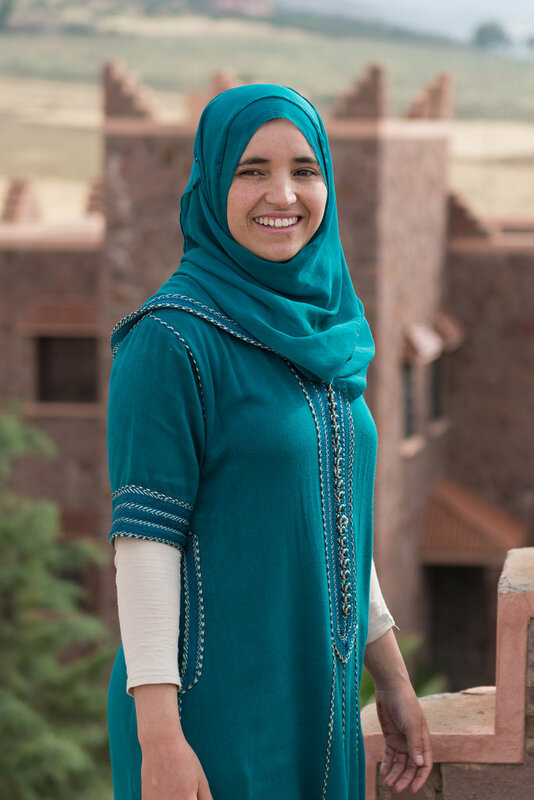 Although I was excited to reconnect with last year’s group, I was pleased to see so many new faces such as Iman and Amina. “We’re cousins but we had never met until a few weeks ago when we both started school here”, Iman, aged 12 said. “It’s our first time working in the garden and we really like it”. 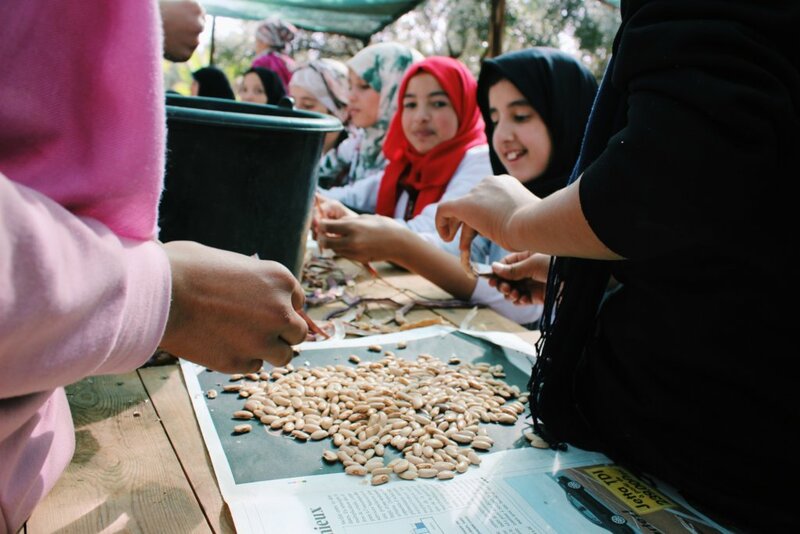 We kicked off this year’s programme with trainings on seeds; we taught the students how to collect, clean and plant them while also educating them about the importance of the soil quality when collecting seeds. “The seeds from our garden are better than the ones we would buy in the market”, said Dar Taliba student Salma, when Cécile asked why we are collecting seeds directly from the vegetables we planted last year. “We know the vegetables and the soil in the garden have not been treated with chemicals”, she explained. During these trainings, we split the group into two teams. One team, led by Cécile, started their training with the collection and cleaning of vegetables seeds. Over the past few months, the gardeners have been drying the last of the summer vegetables, including eggplants and cucumbers, which the girls had planted before summer vacation. Now, the students were able to slice the vegetables open and gather, clean and dry all the seeds inside. 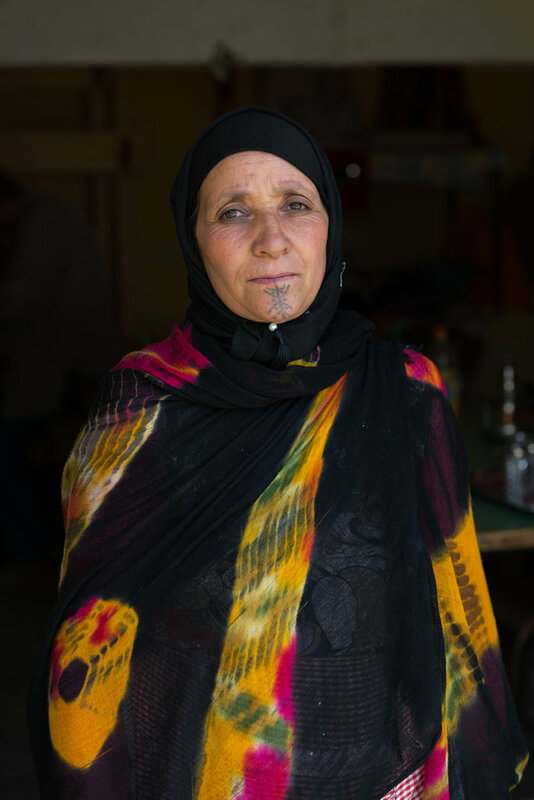 “I had no idea there were so many seeds inside!”, Asma said while collecting seeds from an eggplant. 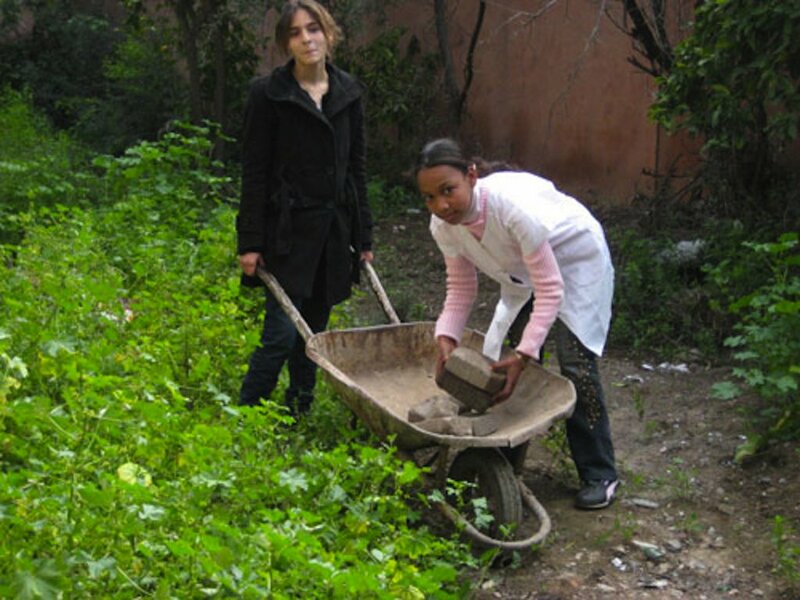 The second team started their work in the garden where Laila taught the girls about the different steps and techniques available to plant vegetables seeds. With little bags full of turnip, green bean and spinach seeds, the girls paired up and assigned each other different tasks such as planting the seeds, measuring the distance between the planted seeds and covering the holes with earth after. Once they were finished planting, it was their turn to collect and clean seeds, so they switched places with the other team. Rotating the teams during their garden work allows every student to get the most out of each training. 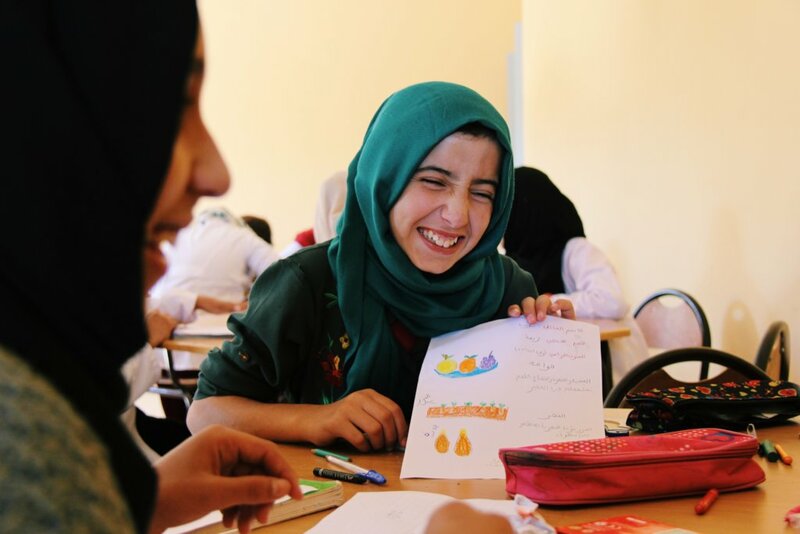 In between these garden trainings, my colleague Hajar and I organised a drawing activity at Dar Taliba with 30 girls last month. After a short introduction about our different projects within the High Atlas Cultural Landscape programme—of which targeted outreach to youth and students on traditional plant knowledge is an important part—we did a brainstorming exercise on local food, herbs, plants and trees to find out which products are found in their households and which crops are grown in their communities. Hajar and myself—both not talented in drawing—were happy to see the result of their drawings and to find several creative little artists in the group! “I made a drawing of wheat because where I come from there are many wheat fields and people working the land”, Meryam, aged 14, said. “I have cut wheat myself several times out in the field”. The drawings produced during these sessions will be used to create a “local household basket booklet”, which will feature 50 local and useful plants and plant products. 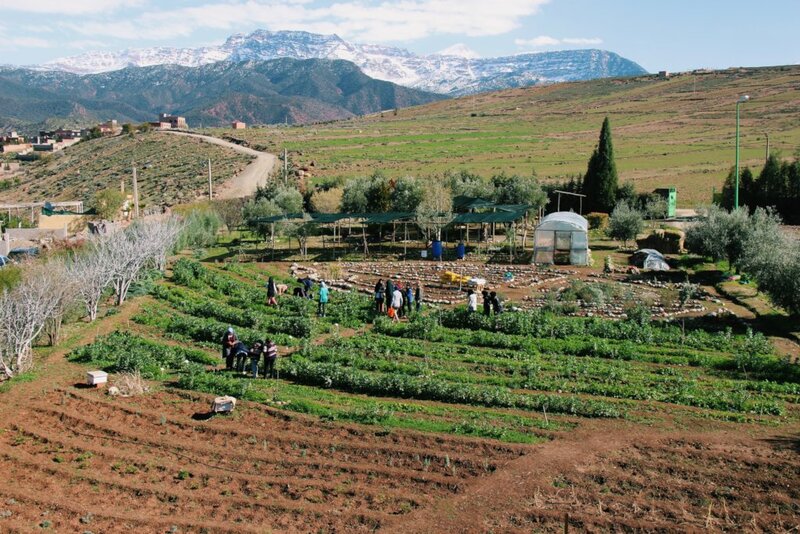 Over the next few months, we are planning to invite local plant experts to join our trainings in the plant nursery to support and encourage the Dar Taliba students to learn more about Amazigh indigenous plants from their communities, located in the High Atlas mountains. Thanks to the generous support of our GlobalGiving donors, we are able to continue our garden trainings throughout the school year during which they will learn valuable skills such as seed saving and expand their knowledge on valuable local plants. Until our next report, you can follow us on Facebook and Instagram or visit our website for more updates about the activities and progress made in the Dar Taliba garden. Thanks again to all our supporters for making these valuable trainings happen! Summer at Dar Taliba: the countdown to an exciting school year begins! 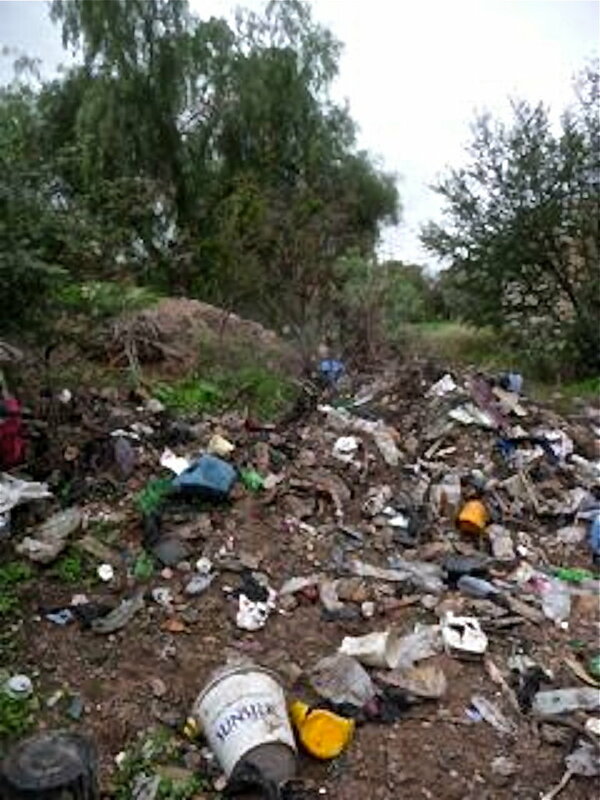 We are in the midst of a hot summer here in Morocco—life usually slows down around August due to the weather and family holidays. 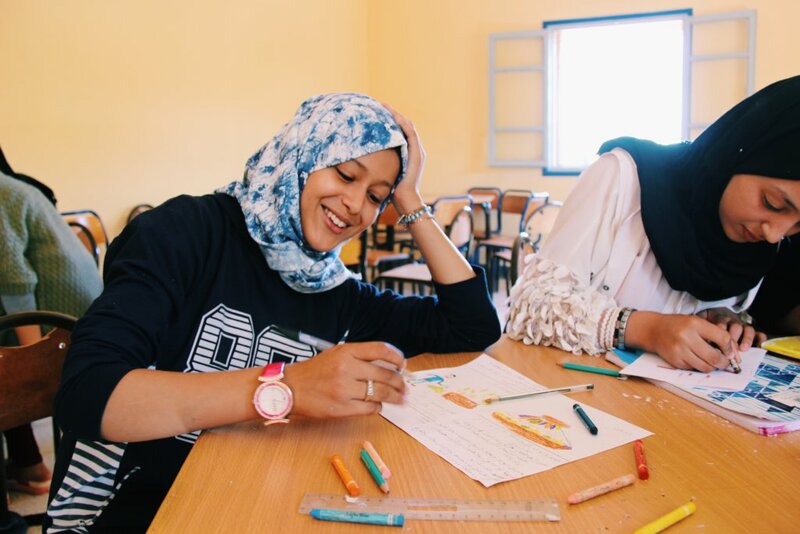 Although the Dar Taliba students have returned home to their families for a two-month school vacation, our team has been busy taking care of the gardens and developing an exciting programme for the girls once they return in September. At the end of June, we completed our first school year of weekly permaculture trainings with a series of practical workshops on composting and water management in collaboration with our partner, Radiant Design. In addition to these workshops, the girls learned how to make an all-natural, organic and non-toxic insecticide with black soap, which has anti-bacterial and natural insecticide qualities. 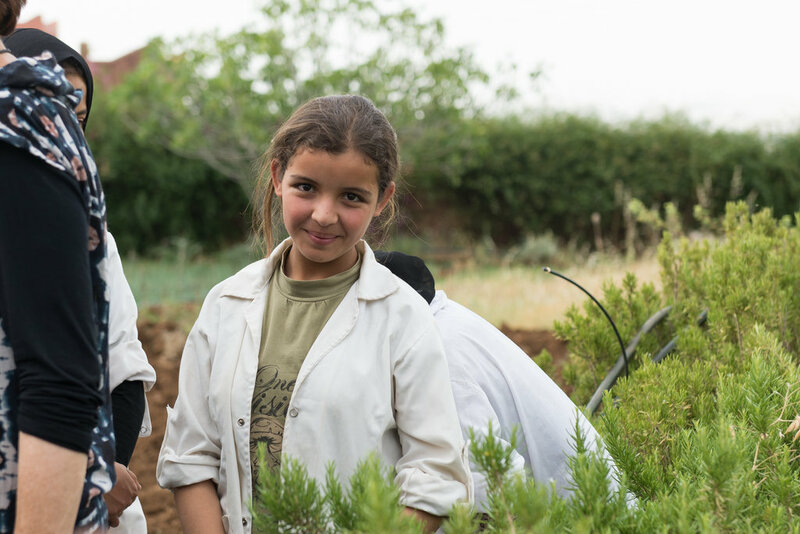 “I think it’s very important the girls learn natural ways to fight bacteria and insects that can threaten all the fresh crops they have been growing over the past months”, Dar Taliba gardener Lhoucine says. 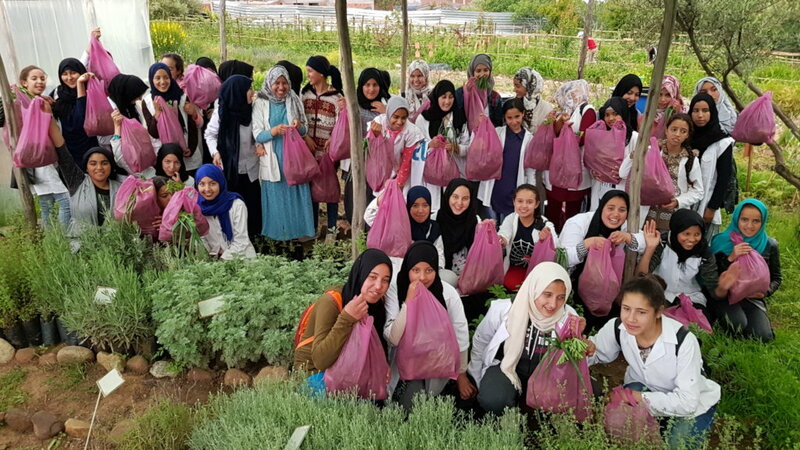 On the last day of the school year, we gathered the Dar Taliba students in the garden and harvested a beautiful mix of potatoes, lettuce, green beans, onions and lots of fresh medicinal and aromatic plants such as thyme. Everyone took home a basket filled with fresh organic produce, grown by the students during their trainings. We hope their families will be as impressed as we are with the delicious results of their hard work! Until the girls return from their summer vacation in a few weeks, our team will have their hands full managing the new irrigation system and the construction of a brand-new seed bank which will play an important role during their trainings next year. We’ve also recently welcomed two families of bees to the Dar Taliba gardens, who have now found their home in two hives located between the vegetable and aromatic plant gardens. We can’t wait for the girls to meet our new friends and learn about the importance of bees for the environment, (not to mention taste their delicious honey and explore its medicinal uses)! 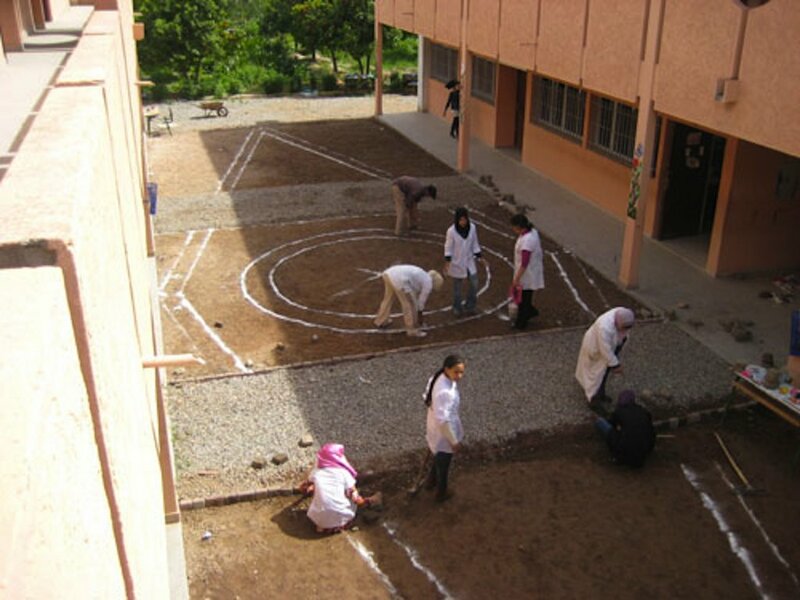 Thanks to the generous support of all our GlobalGiving donors, we are able to start developing an exciting programme of weekly permaculture trainings for the Dar Taliba students. These will enable the girls to grow many more delicious vegetables to bring home to their families, and learn new skills, such as seed saving. We can’t wait to see all the girls and start working with them again very soon. Until then, you can follow us on Facebook and Instagram, or visit our website for more updates! 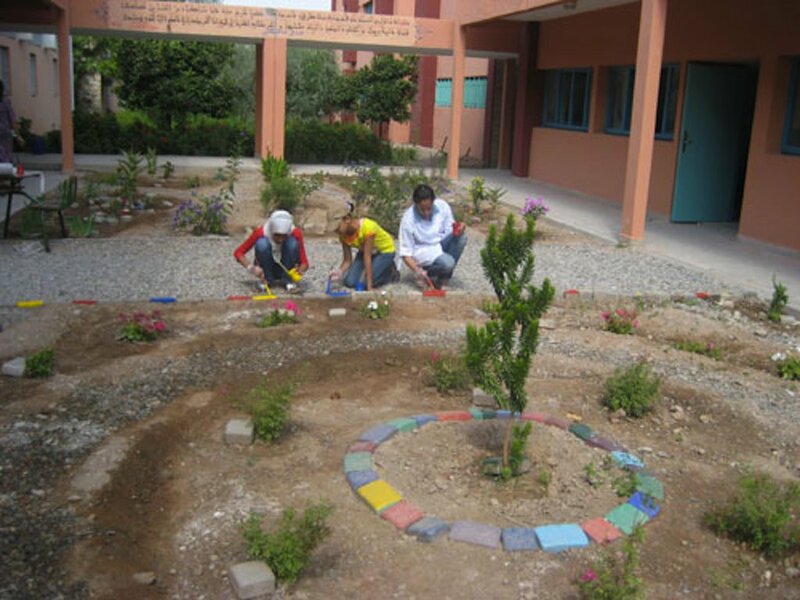 Over the past three months, the Dar Taliba boarding house gardens have flourished. The girls have harvested lots of delicious vegetables, enough to provide weekly school meals for all 130 girls currently in residence. 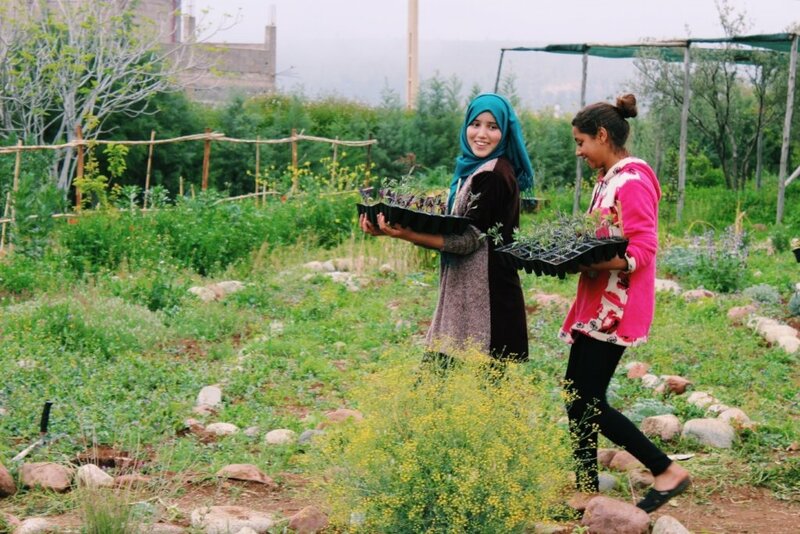 “The vegetables from our garden which the girls have planted taste much better than the ones from the souk (local market),” Dar Taliba gardener Al Hoessein says. With the arrival of spring and some unexpected rainfall in April, the girls have been very busy with the maintenance, harvesting and daily running of the gardens. 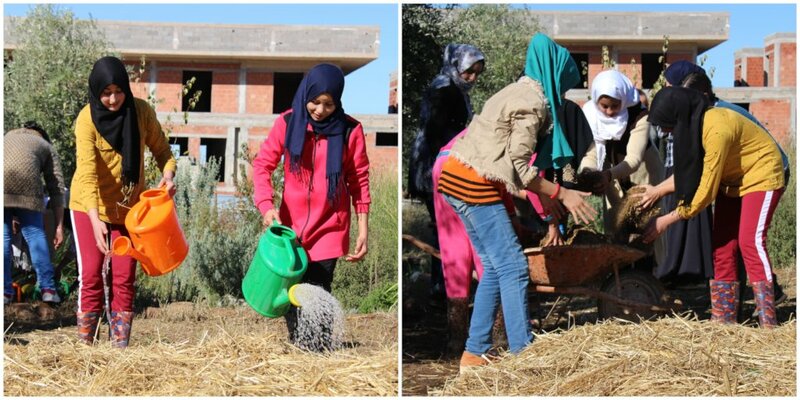 As part of these spring gardens preparations, we delivered 20 permaculture trainings with our partner Radiant Design during which the girls learned new skills, such as mulching. This technique is very valuable as it keeps down weeds, retains the soil’s moisture and protects the soil from drying out, especially during hot summers. 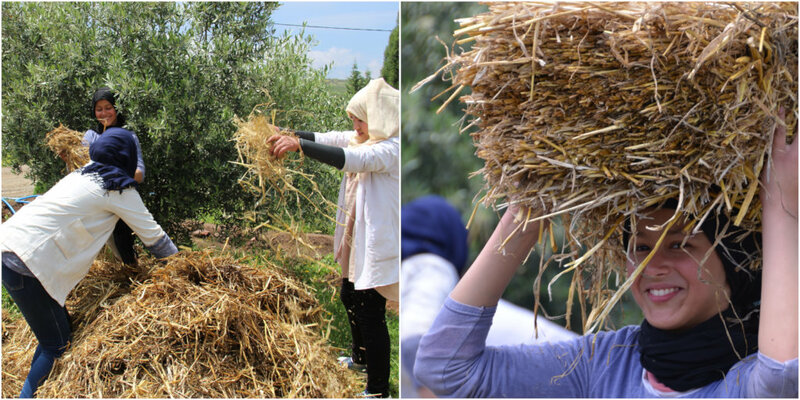 The mulch the girls used during these trainings consisted of organic material harvested in the garden. 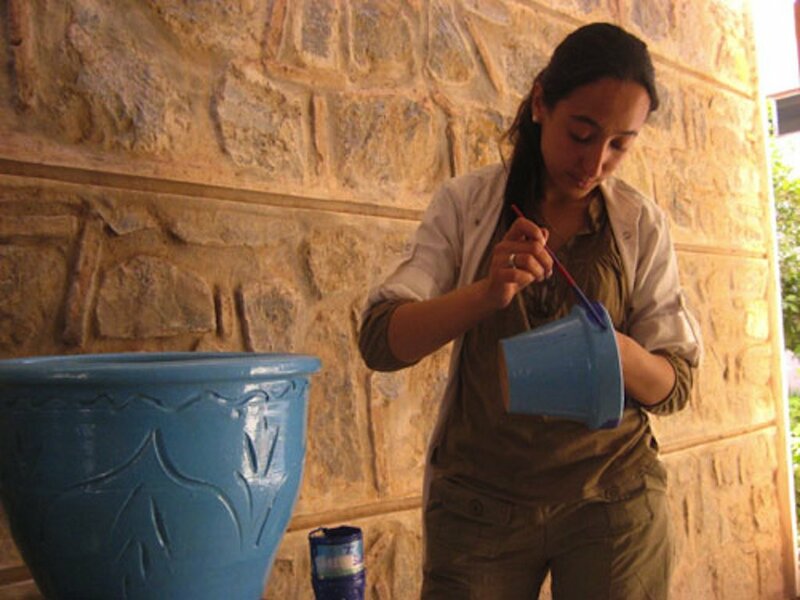 “I really enjoy working with my hands, especially when we are planting seeds,” Kaoutar, aged 14 says. 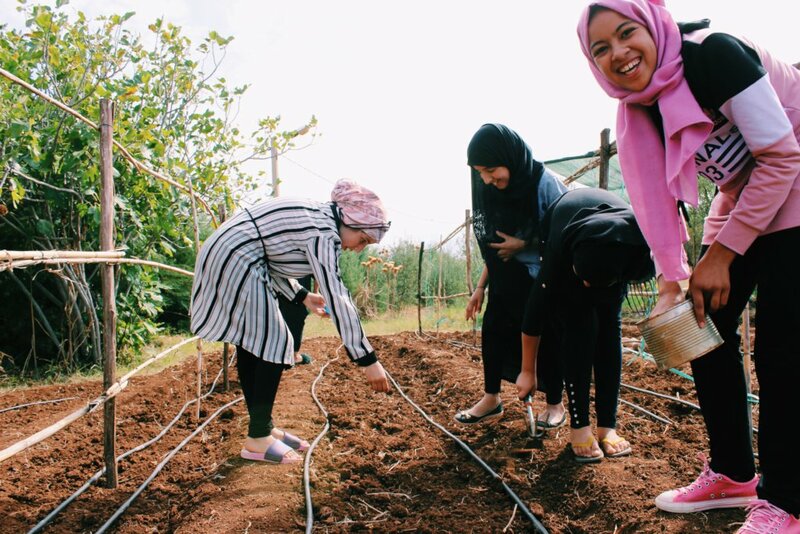 “When we have a break in between classes we often go to the gardens to watch how the vegetables are growing.” Check out our latest video to watch how the girls are practicing new skills during their trainings. The girls demonstrated some other fine skills when they created handmade clay plant labels for all the vegetables they have planted so far. 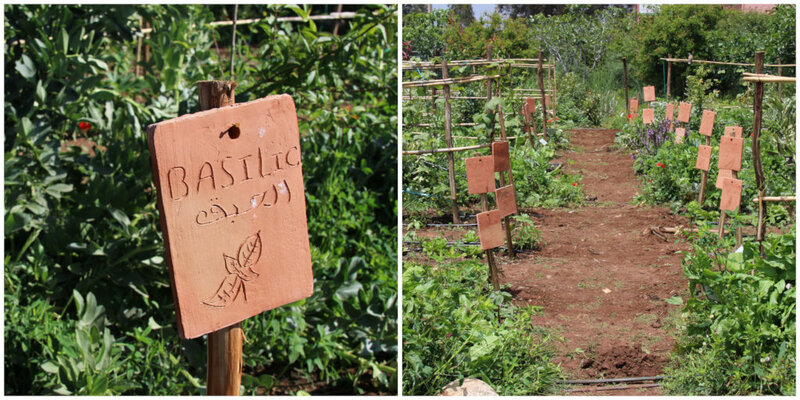 These labels, which are engraved with little drawings and plant names in French and Arabic, are now installed in the gardens so everyone can easily find and recognise the newly planted vegetables, not to mention the beautiful addition they make to the garden! With temperatures rising every day, the Dar Taliba gardeners have been working hard in collaboration with our partner, hydrological engineering firm RESING, to install a new drip irrigation system, which will support the year-round growing and maintenance of the 6,000m2 gardens. All of this growth and harvest of skills and nourishing food wouldn’t be possible without the continuous support of our generous donors at GlobalGiving. Thank you! 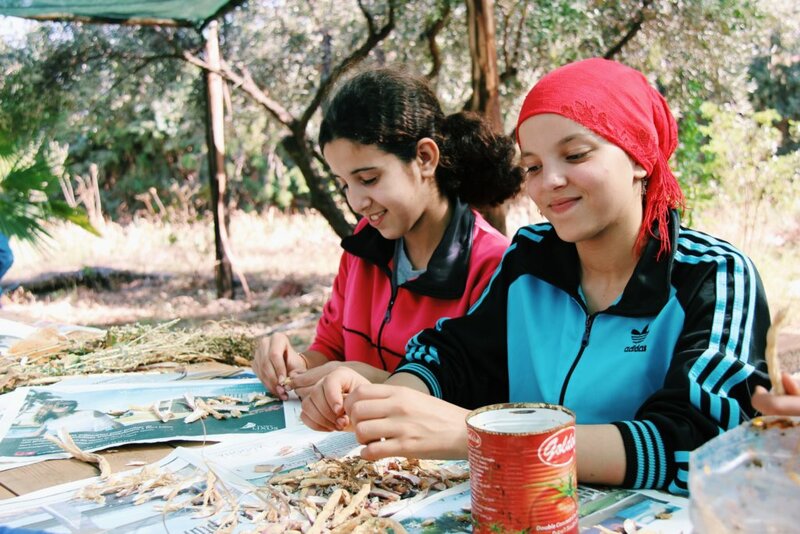 Until summer vacation arrives at the end of June, we look forward to continuing our weekly permaculture trainings with the girls and share with you all our exciting activities and plans for the students at Dar Taliba. You can follow us on Facebook and Instagram for more updates or visit our website. Thanks again for your support from all of us at Dar Taliba! And a blessed month of Ramadan for those who are celebrating. P.S. Since many girls are going home for a few days to celebrate the first days of Ramadan with their families, we distributed zucchini, cabbage, and bunches of spinach and lettuce (all 100% organic!) to all the students, which they will use to cook delicious Ramadan meals! Everyone will bring home vegetables for Ramadan! Garden fun with the wheelbarrow! 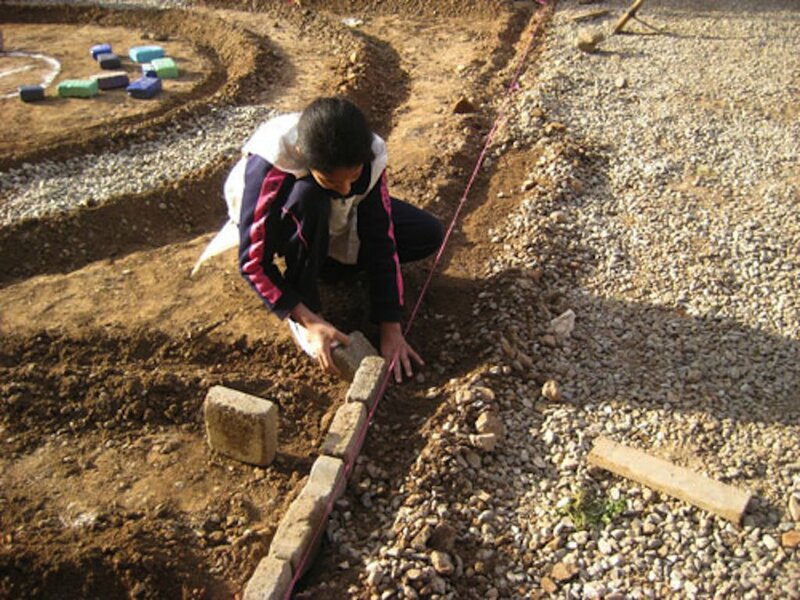 When we reported last, the girls at Dar Taliba boarding house were busy working with our project partners to complete 6,000 m2 of new school gardens. Since then the recreational garden, which is now fully furnished with wooden tables and benches, has become a hub for learning about conservation and studying. “The girls have been studying outside whenever they can”, said Jamila, Dar Taliba director. “I really enjoyed learning about organic fertilisers”, Leila, aged 14, told us. “It surprised me how simple and cheap it is, and how it will benefit plants and vegetables to grow”. The organic fertiliser was finally ready for use this week and the girls are confident their home-made product will work its magic soon. You can read more about what the girls learnt in our online blog. After a busy few weeks of school exams, followed by a two-week winter break, we kicked off the new semester with a session on seed planting during which the girls planted tomatoes, eggplants, cucumbers, zucchinis, onions, green beans … the list goes on! You should have seen the excitement on their faces when we announced they had planted over 800 seeds during the first two sessions alone. 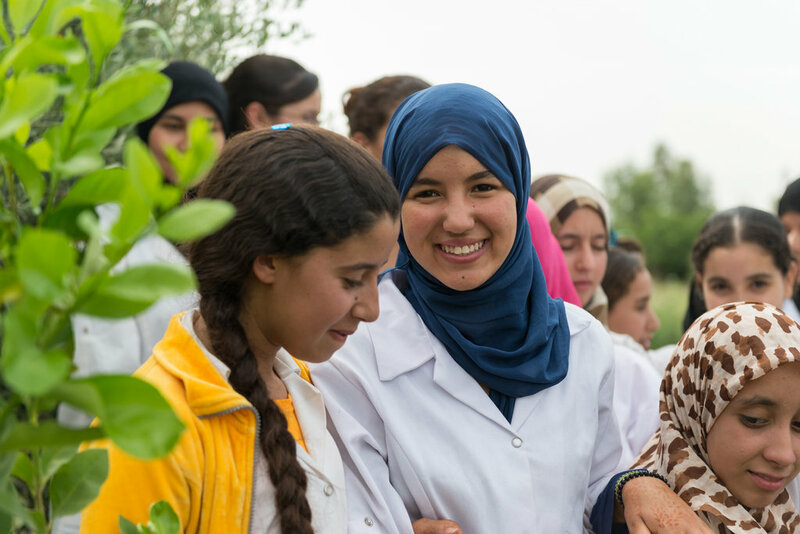 “I planted so many seeds today, I just can’t wait to see them grow!”, Salma, aged 13, said. The students will water their seeds (or ‘babies’ as they now refer to them) every day until they are ready to be taken home where they will replant the seedlings in their communities. As you can see from our pictures, thanks to a very wet winter and all the girls’ hard work, the gardens are flourishing and the first harvest of the year has been collected. The girls are now able to pick fresh turnips and carrots, amongst others, which are prepared for freshly cooked school meals such as the traditional Friday couscous. With spring just around the corner and the girls back in Dar Taliba after a well-deserved vacation, we are all super excited for our upcoming trainings and seeing the newly planted vegetables grow! 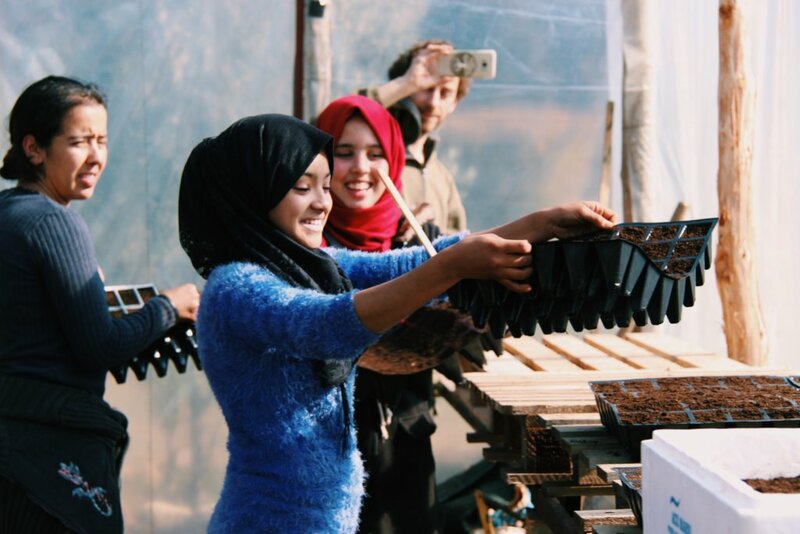 It’s thanks to the generous donations of our GlobalGiving supporters that we are able to continue to transform the Dar Taliba garden into a wonderful place to learn and grow. Thank you! If you want to find out more about our work, you can keep up to date by visiting our website and following us on Facebook and Instagram.